NeoVac DA2 is a core vaccine from NeoTech. It protects dogs against Canine Distemper and Canine Adenovirus 2. For use where a moderate to severe threat of canine distemper and/ or canine adenovirus exists. For use as an aid in the prevention of disease due to Canine Distemper Virus and Canine Adenovirus Type 2. 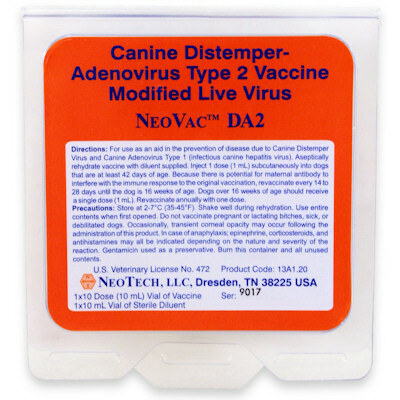 NeoVac DA2 is a high titer, modified live vaccine to be used where a moderate to severe threat of canine distemper and/or canine adenovirus exists. Directions: Inject 1 dose (1 mL) subcutaneously into healthy dogs that are at least 42 days of age. Puppies should be revaccinated every 14 to 28 days until 16 weeks of age. Dogs over 16 weeks require only a single 1 mL dose. Revaccinate annually with one dose.